Mobile Station 1: A Local Band on the Search for Success | Grand Central Magazine | Your Campus. Your Story. Mobile Station 1 is an up-and-coming band that is stuck in a bit of traffic. It has lost half its members while grasping at grunge vibes in the non-grunge decade – all while remaining in a state of being equally cool with and pissed at humanity. The silver lining, though, is that co-founders, Brendin Becker and Rafael Hubbard (Chachi), have an incredible dedication to their music that will keep the band alive no matter the road blocks. “If I am stuck just playing in some trashy bar in Harrison making a small living, then I would still be content. All I want is to just play music,” Rafael Hubbard said. Mobile Station 1 is a local band founded by a group of Mount Pleasant teens exactly seven minutes away from Central Michigan University’s campus. 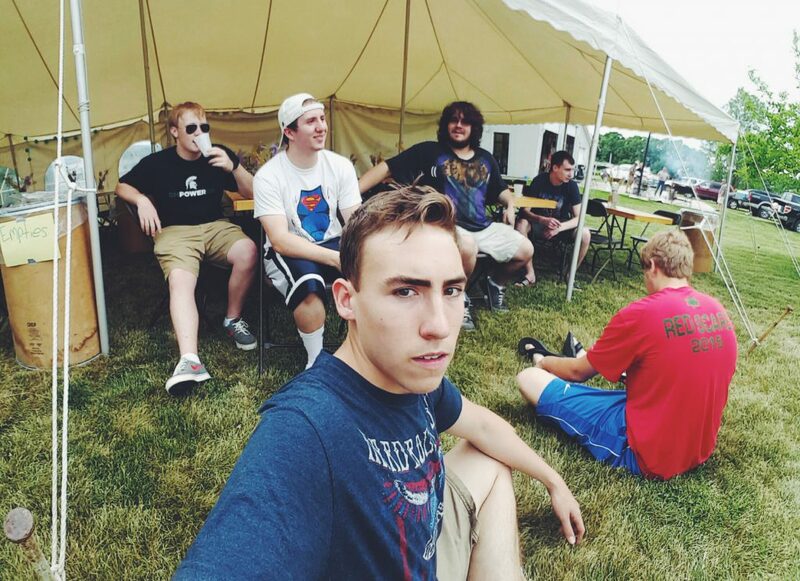 After partaking in the creation of the band his sophomore year of high school, Becker is now a freshman at CMU studying information technology. Becker has been the band’s lead guitarist and now regularly provides backup vocals. Chachi, the rhythm guitarist and lead singer, is a first year-student at Mid Michigan Community College with intentions on transferring to CMU very soon. “All it was were a couple high school friends jamming out in Brendin’s house with no big intentions. But I always wanted to be in a band and thought that would be the coolest thing. We didn’t really take anything seriously, we just enjoyed playing,” Chachi said. In light of recent difficulties in finding a consistent drummer and bass player, the band has taken on a more acoustic style of performing. Lately, Becker and Chachi have been wandering around campus performing freely and writing new songs, as opposed to their former open house and after party venues. They have been setting up shop in residential areas and on sidewalk corners. Although Becker and Chachi have not yet conceded into becoming the punk allusion to Simon and Garfunkel, they still strive to keep Mobile Station 1 alive and growing. “Even if it is just the two of us playing acoustics or whatever, we are still here and still part of a band,” Chachi said. Typically, Mobile Station 1 tends to refers to themselves as a punk band. Performances aspire to reflect deep messages on human conflict while also giving a witty and carefree impression. “There is definitely a deeper meaning to the songs we write, but it’s intentionally passed along with a lighter feel. We bring light [to] issues so that people get it, but are also having a good time with the music,” Becker said. These sort of civilization-rebuking prompts can be illustrated in the band’s original song, “Catch Me If You Can”. “‘Catch Me If You Can’ is like an entire song about running away from society. It starts off very quiet and slow which then builds to a very loud, fast-paced chorus, ‘You will never understand/I don’t want to be an average man/catch me if you can,'” Becker said. Despite a preference to the likes of musical inspirations such as Blink 182 and Nirvana, the band has yet to truly accept a set genre. “It’s a weird genre because we play a lot of different music. We play a mix [of] grunge, punk, with a classic rock sound on the flip side. When we’re doing covers we jam to a lot of Blink 182, Green Day, Nirvana and more classical songs from bands like Lynyrd Skynyrd. Each of us like different types of genres, so it’s hard to just fall into one,” Becker said. Chachi agrees, saying the band was built on a canvas of originality, friendship and the simple bliss provided by the music. “I wouldn’t even label us as anything. I’d say we’re very similar to punk rock, but in reality we’re Mobile Station 1. Everything about us relates to the fun, punk style, but also we’re just us and our own individuals,” Chachi said. Mobile Station 1 takes on a unique character in the name’s origins. Becker had a dream he was lurking through the streets of Mount Pleasant when suddenly an ambulance-like police vehicle came out from the distance in urgency. No matter the band’s fate, Becker and Chachi are simply a pair of dudes loving music, seeking out new opportunities and enjoying a pure friendship. Separator image Posted in Arts & Entertainment, Arts & Entertainment, Music, Music, Pop Culture and tagged with band, Local Bands, Mobile Station 1, Pop Culture, Punk Rock, Samantha Shriber.